Whether you are looking to do the weekly shop or to treat yourself or someone else for that special occasion – You can even buy an Aston Martin! To add a further buzz to your visit the weekly market is Thursday and local Farmer’s Market on the first Sunday of the month. Places to Explore – don’t forget us! Did you know we are bigger on the inside than we look on the outside? Orchard Side House, a Courtyard, the Viper Barn & 2 gardens to explore. Did you know we have our own shop selling unique items? Explore the world of the lacemakers, local history & trades or walk in the footsteps of 2 famous residents – the influential poet William Cowper & slave ship captain turned man of faith and Abolitionist John Newton. Along the way find out about the landscape and local life which inspired William to write the poetry loved by the Romantic poets and John to write the famous hymn “Amazing Grace”. What else Happens in Olney? 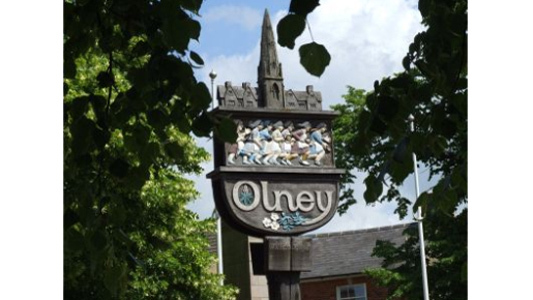 Dates of annual events such as the Pancake Race on Shrove Tuesday, the Cherry Fair, raft and duck races, the Big Olney food festival (BOFF) , firework display and the Dickens of a Christmas can be found on the Visit Olney website or Olney Town Council website . Emberton Park which offers lakeside walks, children’s play areas, fishing, boating and camping facilities is also just a walk over the bridge.